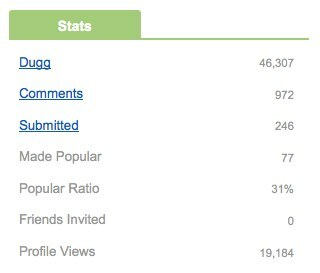 Within the past three weeks, Digg.com has allowed some of their most loyal users to sign up and try out Digg version 4. It has been speculated that they will be doing a full roll out of the new site sometime within the next two months. Being an extremely active digger in the past, I was lucky enough to receive one of these invitations, and have had some time to explore the new Digg before they roll it out completely. I wish I could say that I love it, but unfortunately I can’t say that I do! In my opinion, there are many reasons why I feel the new Digg will be something that fails to deliver on its promise to be “bigger and better,” and more importantly, give the users (community members + publishers) what they want…possibly leading to the companies’ demise. In the current Digg, you are able to add friends, and see what they submit into the site. This is a great way to follow some of the best users who are the core audience that built the site to what it is today. In the new Digg, this feature (seeing what your friends submit) has been completely removed. To me, what doesn’t make any sense at all is why Digg would want to completely remove this amazing part of the site that I rely so much on for my daily news and entertainment. When I first started on Digg, I wanted to follow the people who got the most front pages, and who always submitted the best content that I loved to read and consume. By following these specific users submissions, they always fed me the best content, kept me up-to-date with what was happening in the world, and made me laugh every so often at a funny cat picture or animated .gif video. I would share a lot of the content I found in my friends’ submissions with other social networks and communities because it was either highly valuable or news worthy. By integrating this behavior into my daily online routine, it helped me build more rapport with my audiences on other social networks…which gave the publishers and writers, who had their content submitted into Digg, more exposure themselves. By taking this amazing moving part to the site away (giving you the opportunity to see your friends submissions), it really decreases my motivation to want to even visit the site to see what my friends are contributing…but more on that later when I talk about the “My News” section. Every single day, two or three times a day, I login to the current Digg to see what my friends have submitted. To not have this privilege anymore on the new site is a slap in the face to every digg user that relies on this feature to see what their most trustworthy sources are sharing on Digg. The Negative Domino Effect: If users aren’t able to see what their friends submit into Digg, and if these users normally relied on this part of the site in the past, I have this feeling that there will be an aggregate decrease in click-throughs to content on Digg…which will lead to decreased engagement with publishers’ content…and thus even more frustrated publishers using the site to hopefully hit the front page of the “Top News” section to create a massive traffic spike. The users won’t have a reason to visit the site anymore due to this feature being removed, and may probably move elsewhere to a competitor site such as Reddit. Also, check out the reasoning below based on the “My News” section as I go into more detail on this. Solution For Digg: Add a tab at the top next to “My News” and “Top News” that says “Friends’ Submissions.” Allow user to click the “Friends’ Submission” where they are shown a list of the submissions their friends have submitted to the site. Allow them to click into each article, and give them the option to digg it, just like you have it on the current Digg. Digg’s Possible Reasoning: Digg possibly decided to take this feature away because they want to punish the power user who only digg their friends’ submissions and vice versa. They know people game the site in this fashion, and make money off of hitting submissions to the digg front page. Obviously, Digg wants to put a stop to it. Advice For Digg: Don’t worry about the select few who will still game the site. You are going to get that with any site as there will always be underground networks that control what is submitted, what gets votes, and how things play out. The fact is: the majority of your audience doesn’t want to take the amount of time power users take to consistently get stuff to the front page. Stop making all these changes to the site centered around punishing them (power users), and more about growing a highly engaged community that you can then monetize into more money, thus making your investors very happy. This change more than anything takes one of the biggest social components out of the site entirely. In the new Digg, there are two tabs as shown in the picture above. One of them is “My News,” and the other is “Top News.” The difference between the tabs is the “My News” section shows what you have submitted, and also shows what your friends are digging. “Top News” is just like the same traditional front page diggers are used to when they land on Digg.com. The “My News” section only shows what my friends are digging + submitting…The fact is I only want to see what my friends are submitting because that is all I care about! I know a lot of top diggers share this same opinion, and are really sad to see the site changing like this. For someone like me who has a lot of active Digg friends, there is absolutely no possible way for me to ever keep up with ~200 friends digging all at the same time just from the “My News” section. As my ~200 friends would start to digg, the content flow would be so massively overwhelming and so overpowering in the “My News” section there would be no way for me to keep up with the activity. I would miss out on so much good stuff, and feel very flustered and frustrated all at the same time trying to keep up with everything. On top of missing out on some of the best stuff, there would also be a lot of repeated content that I have already dugg in the past, which I wouldn’t want to see either. Again I am going to say it again…I don’t care about what my friends are digging…I only want to see what my friends are submitting…which is why I feel there still needs to be a place in the new site where you can see what your friends are submitting. (More on that in the Reason #1). The best thing I can relate this new change to is that the new Digg will eventually turn into Twitter…or die completely…either way, the content publisher doesn’t win, and the user who follows a ton of people is frustrated because they can’t keep up with the content in an organized fashion. (See reason #1 for more logic on this). The reason I bring up Twitter is because as more people follow more people, the quality of the engagement, interaction and click throughs to links decrease over time in Twitter. While there still are celebrities who carry some weight, more often than not most tweets are ignored or get a very low CTR (click through rate). I see the “My News” section turning into this very same thing over time, but then again I may be wrong, this is just what my gut is feeling. Also one thing that I think Digg is completely ignoring and being incredibly naïve about is they are assuming that our Digg friends are our friends in real life. This couldn’t be further from the truth. The definition of a “social media friend,” and a friend that you see twice a week for drinks are mutually exclusive. While there may be some overlap in the relationships, to assume that people will connect on the site with people who are their real friends + stay active at the same time sharing content when they have Twitter and Facebook to do that with, it just doesn’t make sense to me. But then again, maybe Digg has its own reasoning behind this. I guess we will see how it plays out. The Negative Domino Effect: If Digg keeps the feature like they have it, where it just shows what your friends are digging without showing what your friends are exclusively submitting, I feel like the “My News” section will turn into Twitter, where links and engagement are decreasing over time in a huge way, or make the new Digg die completely. Because a user won’t be able to keep up with everything their friends are digging, and without the way to see what their friends are submitting, the frustration experienced by the user will lead them elsewhere to a competitor site such as Reddit. Digg is more than just about the content…the community that is built and the community’s experience with the site is just as or even more important to the lifeblood of the site surviving the long haul. Without loyal users who stay committed engaging with their Digg networks every day, you just have a content site…and only having a content site is incredibly boring in this day and age. Solution For Digg: Allow us to see our friends’ submissions. We will visit the “My News” section if we have time to, but it will be an added bonus if we find something that we missed. See Reason #1 for more clarification. Advice For Digg: Digg you are the largest social news site on the internet that connects publishers’ content with your users, and which also gives your users the power to control what hits your front page by giving them the option to share publishers’ stories with their friends on the site and vote on the stories. If the stories get enough votes, the piece of content gets to the front page to be seen by the internet masses. Stop trying to make your new site so complex, and a direct copycat of other sites and framework-models that have already been created. If you are going to implement something new, create something original that is innovative. I don’t need an account on another site that is a facebook or twitter clone. Stay true to your roots and innovate from that. Don’t let your envy of twitter and facebook influence the decisions you are making to the new Digg…Your users will thank you. 3) A Customized Front Page…Wait… What? I don’t know what this is all about, or if I am just seeing things, but for some strange reason the front page on the current Digg, is not the same as my “Top News” page as Digg said it would be. Here are current screen shots of both pages that I took when I wrote this blog post. Now I don’t know why this is, but as you can see, it is clear as day that currently there are two different front pages, and I have absolutely no clue why. Could this mean that digg is going to customize my “Top News” section as well based on my previous activity and friends’ activity in the past? Only Digg knows, and is leaving its users in the dark as to the clarification on this. Now I realize this may be because this is the alpha version of the site, and are only allowing certain things to be in certain places to test things. Even though that may be the case, it makes you wonder why the front pages on both sites are currently different. Solution For Digg: Make the front pages the same. Digg’s Possible Reasoning: Not quite sure…Maybe creating a customized front page based on things only your friends’ dugg to increase customization? Advice For Digg: Be sure to not change up the Digg front page as we know and love it already. 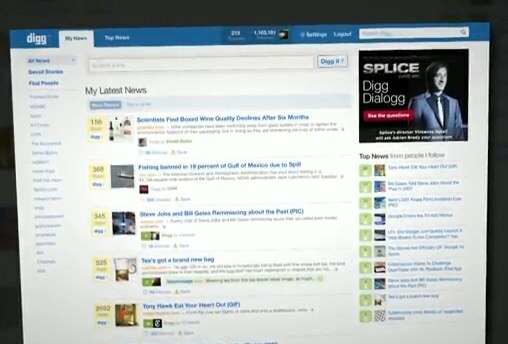 Right now, Digg works by relying on their audience to find the best links to submit into the site. The audience takes the time to find or create the best content, and then submits the article. The only way content is sent into Digg is by way of the user. In the new Digg, the user is taken completely out of this process and allows content creators/account holders and publishers to automatically submit their content into the site as soon as it is published, without the user having to manually submit it themselves. What blows me away about this is that Digg is allowing this to happen, and in doing so going against the initial content submitting model that entirely built the site to what it is today…(30 Million+ Uniques Per Month). I have a feeling that this will be either a massive success or utter failure. My guess is the latter. Most notably, when a publisher or user auto-submits content into the site, it will automatically be sent into Digg without giving them the time to even touch it up to make the headline look appropriate with a legitimately good description. I can only imagine the messed up headlines we will see on the site from publishers who have their content all out of whack when they publish it. There is also another fear for auto-submitted spam from users who decide to use this feature, which no one likes to either read or even come across. If spam is automatically submitted, the quality of the site will continue to go down hill over time. Another fear that I have by implementing this feature on the site is the site will turn into what I like to call a “Content Dumping Graveyard” (similar to what twitter is turning into) because there will be so many publishers auto-subbing their content without enough users to go through it and digg it that it will be completely ignored and completely defeat the purpose to begin with due to reason #1 and reason #2. The combined effect of reason #1 and reason #2 and this issue of auto-subbing content, are going to screw the publisher and user all at the same time. The publisher click throughs will decrease, and the user experience will go continue to decrease, as more and more publishers/users submit their content automatically. The Negative Domino Effect: I personally feel that by allowing publishers and users to automatically submit content into the site, Digg will turn into what I like to call a “Content Dumping Graveyard,” which is very similar to what twitter is turning into each and every day. Small Observation On Twitter: Even though the amount of tweets that are being generated on a daily basis is increasing on twitter, the engagement in the aggregate amount of tweets is decreasing (clicks + @replies)…that is unless you are a celebrity or public figure. I am assuming this is the reality for most people, because I have spoken with other people who have HUGE follower counts (80,000+ followers) that aren’t celebrities or public figures experiencing this more and more everyday. By taking the users out of the equation entirely on Digg, it will lead to them losing even more interest in the site, and thus create an aggregate decrease in engagement due to the massive inflow and disorganization of the auto-submitted content from huge publishers, companies, and users. The bottom line is this…the more people who automatically submit their content into a social media site, and as more and more people do that over and over again…pretty soon you will not have people on the site consuming. While many will be producing and publishing…if the consuming audience isn’t there…publishing and producing becomes meaningless…which means less page views for Digg and decreased revenue and value for advertisers over time. Solution For Digg: Don’t allow publishers to auto-submit their content. Continue to rely only on your loyal users to find and submit the best content into the site. Digg’s Possible Reasoning: Digg decided to implement this feature because they thought it would be cool to allow publishers/users to automatically submit their content because it would give their users more of an option of content to consume. I think it also has to do with them not wanting a popular story to be so much about the submitter, and more about the content, which echo’s reason #1 where they don’t want the front page content to be controlled by power users digging their friends’ submissions. I also think that Digg may have another backend plan to charge companies and individuals to become auto-submitting publishers adding another stream of revenue for the company. Advice For Digg: When you alienate your audience, they will go elsewhere (Reddit). By allowing publishers and users to submit their content automatically…you just removed your users’ power to make an impact on the site. In the new site, the only thing you are really relying on your audience for is to consume advertisements, digg something, and comment on something. Don’t take away their power to decide what should and shouldn’t be submitted into the site…by letting publishers do this automatically, it takes away another social component to the site aggregately speaking. In the current Digg, the recommendation engine is a place for you to find new interesting content from your friends who are also digging content. Content is matched up with you based on what you and your other friends are digging. The current recommendation engine is brilliant…unfortunately Digg decided to completely remove it in the new Digg. I don’t know why they chose to completely remove this, but I am saddened by this. I would always take the time to visit the recommendation engine to find random articles that my friends didn’t submit. It would allow me to find interesting things to also share with my network, and inform me about new trends online that would help me in my current business. I am not entirely sure why Digg took this away, but I am again really pissed that they have. The Negative Domino Effect: Possibly lose more users who relied on that feature to find new interesting content. 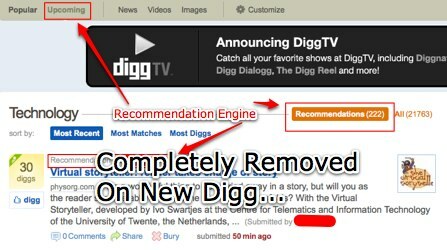 Solution For Digg: Bring the recommendation back some way. Digg’s Possible Reasoning: They removed the recommendation engine because you will now see what your friends are digging in the “My News” section of the site. Advice For Digg: Don’t take away something that is so brilliant on your site already. Currently in Digg as we know it, each user has stats as seen in the image above. In the new Digg these stats, and all the fun in generating a Digg front page from your profile has been abolished from the new site…for good. When I started to see where the new site was heading, I was not happy at all. When I saw that they will be removing personal statistics, the reality of that was a knife to the heart. This is going to take all the fun out of what makes Digg the site it is today. Every single front page story that I get, and every single front page story my friends get is meaningless now. There is no recognition for being someone who is able to find a really good story and get the story to the Digg front page. It makes me angry knowing that Digg wants to completely take the fun out of what makes Digg Digg. 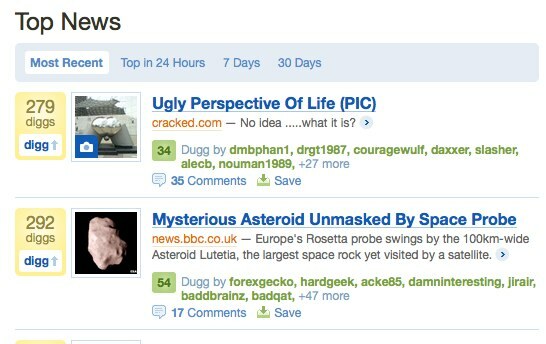 To me, and many other diggers, Digg is a game and a place to find the best most popular stuff on the web. By taking away user stats and an incentive to hit front page stories, it takes out all the fun…making the site more like a boring “Content Dumping Graveyard” as described above. The Negative Domino Effect: By not giving the users an incentive to submit into the site in hope that they will get a front page, you remove the thing that keeps them addictively digging and engaging with the community on the site. In the end all of this will make the content on the site suffer, and turn more into a boring mainstream news site that can be found on any other website. Solution For Digg: Bring back the stats and continue to give power users the continued incentive to find the best content, interesting pictures and funny videos that always seem to make it to the front page of your site. In the current Digg, you are able to subscribe to RSS feeds for specific topics and pages within the website. For example, say you wanted to get every single submission that went popular on the technology home page delivered to you automatically, in the current Digg, you can add that specific RSS feed to your google reader and always get this content delivered to you as it is made popular within the site. Unfortunately, in the new Digg…That feature has been taken away as well. What doesn’t make sense to me is that with this change to the site, Digg is making it even harder for their users to consume the type of content that they want. Rather than allowing the users to consume content on Digg on their time, Digg is making it a priority that users consume the content on Digg’s time, or not at all. I feel this is a little unfair to have Digg treat their audience this way, especially because those who rely on this feature to find the best stuff to share with their networks won’t be able to do that anymore. It doesn’t make sense why they would remove the RSS feed, unless they have something in store that we aren’t seeing yet in the alpha version. In the current Digg, I use this feature to collect all the stories with the word [Infographic] in them. I do this because I love looking at and consuming infographics, and this is the easiest way for me to stay on top of them so I don’t miss any! After finding a good infographic that was submitted into Digg, I would more than likely share this with my various networks, who would enjoy it as well. It really saddens me as well that they are taking this part of the site completely away as well. The Negative Domino Effect: Because Digg isn’t giving their users the features they are used to having, the users will go elsewhere to find the best stuff where it can be delivered to them via RSS, instead of relying on Digg to feed their google readers. In doing so, the click throughs on the site will continually decrease to publisher content, and the audience will probably go elsewhere in search of a site that will better suit and cater to their needs. Solution For Digg: Add the RSS buttons for each popular category as you have it in your site right now, and also do the same for search. Digg’s Possible Reasoning: I think Digg made this change because they probably want their users to stay on the site more to consume more ads, generate more page views, and click on publishers content…instead of allowing the user to rely on the RSS feed to sort out the content for themselves. Advice For Digg: Stop making it so difficult to consume the content on your site. There are many different types of users who visit Digg, with many different needs. Keep the options to consume the content on your site plentiful, and in doing so, your audience may stick around despite all of the off the major changes you have made to this new design. Digg’s website as it stands in its current version right now is one of my favorite websites on the net. It gives me everything that I would ever want in a site: news worthy content, content that makes me laugh, a community to engage with and relate to, and a way to drive a lot of traffic through my site and my friends’ sites. It seems that the majority of the changes they have made to the site have been created to punish the power users who control the Digg front page. While Digg may justify their reasoning focusing on other points such as saying that the changes make it bigger, better, and give the users more of what they want, I personally feel this new site design may be the final straw to Digg’s demise. Social media is something that involves people. When you take the people completely out of the equation, as many of Digg’s new features have, all that you have is a giant content dumping site with very little engagement with a lot of content. By punishing certain parts of the audience with the new sites design, I don’t think it will go over very well with new people who sign up for Digg who didn’t even know what Digg was to begin with. Not only is the new site more confusing, but even worse, it looks like a facebook and twitter clone in its look and how it works. A mentor of mine once told me, “A confused mind always says no,” which will mean the stickiness of new users staying on the site will probably decrease over time as well. It seems as though this new redesign is one that favors major content publishers and creators and leaves the little guy in the dust, with little to no chance on fully leveraging Digg’s audience for traffic and exposure. By moving toward this new route, I fear that Digg is moving away from its original focus, and instead looking to cater to the massive media publishers because that is the only way they may be able to generate a substantial return on their investors’ money. Whether these specific changes to the site were created out of disgust to power users, or to appease investors wanting their money back + interest…we can only speculate as the site makes its full transformation sometime within the next two months. As you can see, I am not very happy about it, but will adjust as necessary because I personally have no choice but to adjust. I just wish that Digg would listen to its audience, and hopefully will add some of the sites’ best features that are on the current version as it stands now. Your post is spot on. Start experimenting with Reddit. . .different but fun. Thanks Derick. I think I just might start experimenting with Reddit. relay piss me off. I use this lot. Hope some one from digg team see this and add it again. I am right there with you Jack! Thanks for the comment! We do plan to have RSS feeds. Yep you’ll love Reddit – however, Digg4 definitely won’t be the demise. Anthony-What do you like most about Reddit? Looks like I’ll be spending more time on Twitter, Sphinn, et al. I don’t blame you Emory! Thanks for your comment! Absolutely spot on. I seriously hope Digg considers feedback from the community before implementing–and failing–with newdigg. Making the site a sort of competition is what has made it great. Completely eliminating that component will turn Digg into a dysfunctional news aggregator with the inability to say no (or yes, for that matter). Thanks TB! Right there with you! Thanks for the comment! i like the new version of Digg. I’m not a ‘power user’ and as such don’t have a few hundred followers or submissions. I would like to think that if I posted a story I would have as much chance for someone to see it as anyone else submitting a story. I’m tired of submitting a story a day before someone with a higher ranking re-submits and gets all the credit. Sorry, new Digg 4 is a much more level a play field. Draez- I can definitely understand where you are coming from. Thanks for your comment. I am sure with the new Digg…like anything new…there will always be an opinion for those who like it and those who hate it. I appreciate you for sharing why you like it as I am sure there are people who do. I agree to some extent about the functionality changes and how it could possibily negatively impact Digg but don’t see how it would lead to its demise – power headline gets the attention, like the content submitting dumping ground would work – at least your article HAS insightful, interesting content! The auto-submission and dumping ground is a real scenario and is why I pretty much gave up on Twitter. No-one posts now, it is all scheduled tweets, pushed content, nothing interesting or attention grabbing. Just another tool in the marketing machine to push ‘stuff’ not something to garner interest and engage people any more. Twitspamming will turn into Diggspamming, anything to help hack/boost peoples SEO rankings. Chris thank you for your insight and thoughtful comment, and for the compliment on the post. I worked hard on it and appreciate it! You do bring up a great point about twitter turning into an automated dumping ground. With regard to auto-submit, I think you need to see this in the context of where the web is going. Digg are, I think, trying to create a system which is less about getting users spending time at their website, and more about getting a big increase in the number of people Digging stories from around the web. They need to do this to compete with the Facebook like button, and we should all want them to succeed if we don’t want Facebook to become too dominant. 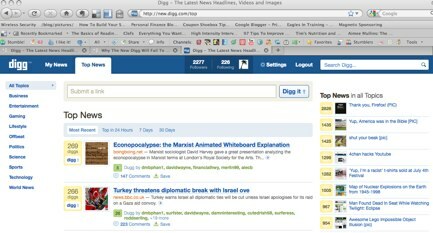 For non-regular Digg users to use ‘digg this’ buttons around the web, they need to be able to digg things with one click; that means things need to be pre-submitted. It’s about users thinking digging something is easy. That does mean that getting submitted will be less of a filter of stuff, but that just means they’ll need to make getting Dugg a lot more of a filter. If you get enough people Digging around the web, you could end up with stories needing, say, five Diggs to even appear in the site’s listings. Just think this – if more users are Digging, they won’t tweet links so much, making Twitter a bit more bearable. The automation for me makes me switch off. If people don’t have the time to sit and contribute at the time about something useful, provoking, etc. then I don’t have the time to read it. I engage with people, not robots…. Agree with you completely Chris! LOL Thanks for sharing this Dean. Thank you for your comment Rashid. I am right there with you! 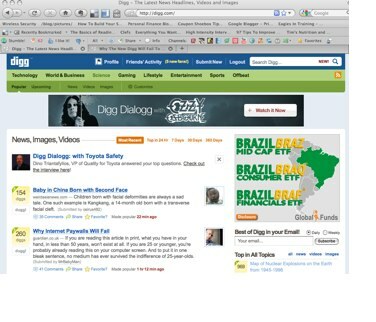 It’s easy to criticize the changes, the harder question is how would you fix Digg? It’s not okay ‘as is’, it’s losing relevance and impact with the masses (I’m happy the power user is getting de-powered). This should be read by digg team. Some great advice to be implemented on new digg. I always prefer using older version and its just fine. New digg may not lead to increase in revenue, or traffic concerning many of the power users and regular users hate it. Thanks for your comment Sid! Definitely a solid point! I hope Kevin and Alex address these on diggnation, that would be awesome. The change is good. So what the “power user” elitism has been vanquished and some of the features that were at the surface have been incorporated into the engine. I like the new Digg, it’s clean and relevant. Digg has been crippled and unable to change for years, so it’s a lot of changes at once. I don’t believe any of the reasons listed are actually detrimental, just different. And some may still need refinement – I would like to see the upcoming news feed also. And keep in mind: the rehash is still in alpha, meaning that want this feedback, that’s why you got an invite into the alpha site. Saying the company will fail like everything is final is premature. Anyway, I’m liking the changes, they will open the site up to a wider userbase so it doesn’t end up a dusty room of geriatrics like Friendfeed. And I will never set foot in reddit again… what a waste of time that site is. Absolute wasteland void of any intelligible conversation – like Youtube. So it really seems like they are taking away all the good stuff and nothing great seems to be added according to this article? Perhaps you can send this over to the digg team so they can consider your suggestions. I think it is sad that the people who want to interact and communicate on Digg are going to be or feel alienated. To me it’s a shame both types of users can’t be accommodated i.e. 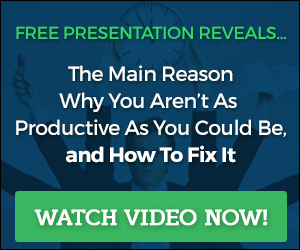 what you call power users people who are creating a lot of content, actually more often than not just trying to earn a living rather than trying to become Internet millionaires, and the guys who like to interact in a community. I mean if the power users produce quality content, and not the re-spun rubbish you find so often, that people want to read and maybe share, why can’t they submit to the site. Half the time there is little opportunity to spend time interacting because they use their time researching and creating content, someone has to at the end of the day or there would be nothing to Digg. So my vote is for a Digg that is open and receptive to both worlds and one that recognizes true effort and quality. The Digg community will do that by either knocking back the junk or promoting the good stuff. This is the whole reason to do beta testing, to reveal stuff like this. That being said, I don’t see any of your points as deal breakers. Most non power users like me stopping using Digg a long time ago. There is just too junk that is of zero interest to me. The new Digg addresses a lot of my concerns. Great to see Digg taking a chance at innovating. Unfortunately, a lot of your views may be correct and lead to a downfall if they don’t take proper action. Thanks for your comment Charles. It seems like they are starting to bring back the old features…but it looks like the damage has already been done to the community. It will be interesting to see what the next six months will bring. 2 years practically to the day! Yeah – It dawned on me today that I wrote this article when I heard the news.